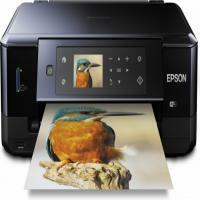 Epson XP 620 is an all-in-one printer best known for its networking features. It offers quality prints for text documents to graphics and images. The wireless device also offers PC-less printing and boasts a large touch screen panel. The printer weighs approx. 21.5 lbs and measures 15.4 x 19.8 x 5.4 inches. It has two input trays; a 100-sheet plain paper tray and another 20-sheet blank photo tray. It also has a 2.5-inch colour display with touch screen panel. The printer uses 5-colour ink system including one extra photo black ink along with other Epson XP 620 ink cartridges. The Epson Premium XP 620 is slightly larger than other Epson printers in this price range. It boasts many advanced features that can be useful at any small office as well as at home. The printer also has a 5-ink system that makes the Epson XP 620 inks to last longer. However, the printer does not have ADF or fax functionalities and it also has a limited paper capacity. You can also pick EPSON XP 620 ink multipack (26XL multipack) to save more on your printing expenses. How to fix a print quality issue in an Epson Expression XP 620 Printer? Has your printer started printing weird photos with odd colour contrast? Or, just missing some colours and have lines on them? These are common issues with an Epson Expression series printer that can occur either due to blocked printhead nozzles or due to the dried out Epson Expression XP 620 ink cartridges. Whichever the cause is, the print quality issue can be resolved by following some easy steps. Sometimes old ink cartridges start getting dry and produce printouts in a low quality. You need to check the purchase date of these Epson Expression XP 620 ink cartridges. If they were bought long ago (longer than 6 months) and haven’t been used on regular basis, it is time to replace those. Q. What is the difference between buying your compatible Epson XP 620 ink cartridges in multipacks and buying individual ink cartridges? A. There is no difference between the ink cartridges provided. Multipacks are meant for those who have high printing requirements. Buying multipacks containing all the colours is comparatively cheaper than buying individual ink cartridges of all colours. Q. Do you also provide the paper that I can use with my printer? A. Yes, we provide envelopes, greeting cards, A4 size white paper, glossy photo paper, double-sided glossy photo paper, matte paper and double-sided matte paper. Just make sure that your printer is compatible with the paper media. Q. My black Epson XP 620 ink cartridge is almost empty. But, I still have some pages I need to print before I can replace my ink cartridge. Is there any way I can continue printing while conserving the black ink? A. Epson printers come with a feature that enables the printer to create black ink using a mixture of the other colours to extend the life of the black ink cartridge. When the black ink is running low, you will receive a pop-up message on your computer screen asking you whether you would want to conserve the black ink. Click “Yes” to use this feature, select “No”, if you want to use the remaining black ink for the current print job or select “Disable this feature” if you do not want this message to appear till you next replace the black ink cartridge. Q. How do I reduce my overall operating costs when using my Epson XP 620 printer? A. You can reduce your operating costs by choosing our compatible Epson XP 620 ink cartridges for your printer. Our compatible Epson XP 620 ink cartridges are XL cartridges that are cheaper than the original ink cartridges while providing the same output quality. You can further reduce your operating costs by buying our multipacks as they are cheaper than buying all the ink cartridges individually. Q. How many pages of paper can Epson XP 620 printers handle? A. Epson XP 620 printers have two input trays. One tray can handle up to 100 pages of plain paper and the second paper tray can handle up to 20 pages of photo paper. Q. I tried cleaning the printhead in our printer (which I bought four months back) but it didn't happen. I noticed later that the ink level in the EPSON XP 620 ink cartridges was less. Is it because of the low ink level or has some problem occurred in the printer? A. Printhead cleaning should be avoided when the ink level is low. That's the reason for cleaning not taking place in your printer. Please ensure that there is sufficient ink level the next time you perform cleaning of the printhead. Q. I'll be using compatible ink cartridges in my EPSON XP 620 for the first time. Can you please tell me if they don't cause any sort of damage and are reliable like genuine cartridges? A. Compatible ink cartridges are in every way high-quality and reliable like the original ones. They help you cut costs and deliver the same premium results; the only difference is that the compatibles are created from recycled material. They do not cause any damage to the printer because they look, measure and function just like the original ones. Q. I plan to buy compatible EPSON XP 620 ink cartridges from you, which will be the first time. I would like to know if you provide 100% guarantee on the purchase, just in case it's needed. A. Yes, we provide 100% guarantee facility along with dedicated customer support which you can avail of hassle-free if you buy the cartridges from you. Q. Are compatible EPSON XP 620 ink cartridges easily available with you in multipacks, considering the heavy demand for them? How soon can you deliver if I need them urgently? A. We usually have sufficient stock of most of the cartridges, so we are prepared to deliver what you need instantaneously. If you place your order before 12 noon, you can expect to receive the same on the basis of 1 - 2 delivery day and if your order is very urgent, please place a call on 048 30833221 to check stock availability with us. Q. Does the EPSON XP 620 printer works with Windows 10? A. Yes, the EPSON XP 620 printer works well with Windows 10. Q. Can the EPSON XP 620 printer print on heavy paper or cardstock? A. Yes, the printer can print on heavy paper or cardstock. Q. Is the CD tray included with the printer? A. Yes, the CD tray is included with the printer. Q. Does the EPSON XP 620 printer contain a separate paper tray for different paper sizes? A. Yes, the printer contains two separate trays, one for larger paper and one for photos. Q. Does EPSON XP 620 printer have a scan feeder means can I load 30-40 pages at once and will it scan them all? Or do the pages have to be loaded individually? A. Unfortunately, the Epson XP-620 does not have a scan feeder. Q. Can I turn off the automatic two sided printing? A. Yes. In the "Printing Preferences" menu there is a place to set the two sided printing to "Off". By this, you can turn off the two sided printing. Q. Can I replace the EPSON XP 620 ink cartridges individually as they run out or I have to replace all of them? A. Yes, you can replace empty EPSON XP 620 ink cartridges individually. You do not need to replace them individually. Q. How to identify the correct ink cartridges for my EPSON XP 620 printer? This is my first time replacing them. So what I should be looking for on the box? A. All the EPSON XP 620 ink cartridges listed on this page will surely work in the Epson XP 620 printer. Correct Epson cartridges can be easily recognized as it has the Polar Bear packaging which indicates that they are genuine Epson inks for the XP 620 printer. The best way to check if the cartridge is compatible to use from our website, or the manufacturer's website, or your printer manual as your reference guide. You can also use the unique manufacturer part numbers to check the cartridge compatibility. Q. I have been using your compatible Epson XP 620 ink cartridges for a while now. The print quality has always been at par but there is an issue occurring since two days. The printouts has lines running through it. How should I rectify this? A. If you notice white and blank lines in your printouts, it is called banding. Try to run a nozzle check to see if any of the print head nozzles are clogged and clean the heads. Do make sure the paper type setting matches the type of paper you loaded, also make sure you loaded the printable side of the paper correctly for your product. Try printing after checking the above mentioned things. If the problem still persists after this check ink levels of Epson XP 620 ink cartridges. For any assistance regarding the same feel free to call customer support services on +44(0)28 308 33221 or drop a mail to us at info@printerinkcartridges.ie where we will try our best to solve your issue. Q. The ink of color Epson XP 620 ink cartridges is expended even though I print in black only. Why does this happen? A. To keep the print head clear and ready to print, the printer uses a small amount of ink from all the cartridges whenever it prints. Even if you select Black/Grayscale, some color ink is still being used. Epson printers contain a permanent print head that needs to be charged with all colors to work. Even when you are printing black text only, a small amount of color ink is used to keep the print head charged. The print head needs to be kept charged to prevent air bubbles from entering. Air bubbles can damage the print head. Therefore, once one of the cartridges is expended, the printer signals you to replace the cartridge in order for printing to continue. Q. From where can I get to know the printers with which my Epson XP 620 ink cartridges are compatible with? A. The list of printers have been provided with every cartridge page linked to Epson XP620 printer. You can see the same from the following link : https://printerinkcartridges.ie/26xl-t2631-photo-black. Scroll down the page and the list is mentioned at the right side of the page. Q. I saw your compatible version of Epson XP 620 ink cartridges and I wanted to try them. But I am not sure whether they’ll work with my printer. Can I return the cartridges if they don’t work? A. We assure you that the cartridges shall be compatible with the printer it’s mentioned to work with. If the cartridge fails to operate within 30 days of purchase and wish to arrange a return please contact us by telephone on 048 30833221 or email us on info@printerinkcartridges.ie. Please have your invoice number and order details ready. We will explain how to return the item(s) to us, let you know whether we will require any documentation (print test, diagnostic report etc) and provide you with your Returns authorization. For further details on return policy refer to the following link: https://printerinkcartridges.ie/return-policy. Q. I wish to place a bulk order of the compatible Epson XP 620 ink cartridges. Is there any discount if I place a bulk order? A. Before ordering, please check whether the bulk order of the same is valid or not since not all cartridges are eligible for bulk orders. Also, we don’t offer discounts as our compatible ink cartridges are already priced at minimum value. Though we offer a coupon for 5% discount if you like us on Facebook, follow us on twitter or rate us at Google plus. Q. What are the number of expected copies I can print using the compatible ink cartridges of Epson XP 620 printer? A. The Epson XP 620 printer uses 26XL cartridges which yield more copies than the normal cartridges. The black ink cartridge yields 900 prints while other colours yield 995 prints. This has been estimated on printing 5% coverage onto an A4 page, therefore it shall vary upon how extensive your ink usage is.